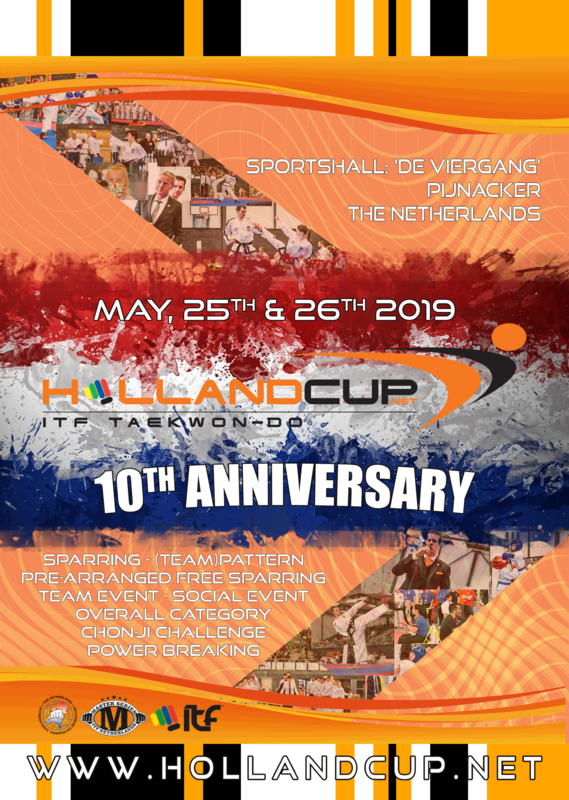 We are extremely happy to invite you for the 10th-anniversary celebration of the Holland Cup. This tournament will be organized in Pijnacker, the Netherlands, on the 25th and 26th of May. All degrees, grades, levels and ages are more than welcome. The Holland Cup is known for being one of the best run and most prestigious tournaments in the world. On this festive 10th anniversary edition, competitors can compete in sparring, (team)pattern, power breaking, open category sparring, pre-arranged free sparring and the Chon-Ji Challenge. The Holland Cup will use the Sportdata scoring system, which is also used at World- & European Championships. Importantly, black bets competitors are offered 2 patterns in pattern competition, and 2 rounds of 2 minutes in sparring competition. Blue belt and up competitors compete on Saturday, whereas lower grades compete on Sunday. For our well known International Team Event, we will select and invite the top competitors that compete at the Holland Cup! This team event will be organized on Sunday morning. If you are curious which top competitors have already confirmed their presence at the Holland Cup 2019? Look at our Holland Cup ambassadors on www.facebook.com/hollandcup.net or www.instagram.com/hollandcup.tkd. It doesn’t get any better than this! For more information visit www.hollandcup.net or www.sportdata.org. Don’t miss it!